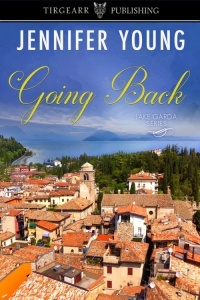 Going Back is Book Two in the Lake Garda series, but it doesn’t matter if you haven’t read the first book in the series, A Portrait of My Love, because Jennifer Young swiftly fills in the events that have brought Leona to this point. The story offers two romances for the price of one, as Leona’s mother, Alexandra, who has her ow n troubled history with the Manfredis and a desire to keep Leona and Nico apart, is coming to realise the true extent of own feelings for the man she married on the rebound, Simon Smart, and believes there’s still a chance for them to find love even though they’ve been divorced for years. Their gentle but sincere attraction is in contrast to the hotter burn of the passion between the feisty Leona and the equally impetuous Nico, who both tend to act first and consider the consequences afterwards. A good chunk of the action is set in and around the town of Verona, including a visit made by Alexandra and Simon to Juliet’s balcony, and the tale of Romeo and Juliet is a strong influence on Going Back. But Young gives the concept of warring families a contemporary twist or two, making you root for both Leona and Nico as they attempt to thwart Faustino’s evil plans. My only quibble is that the chapters from Leona’s point of view are told in the first person and those of the other characters in the third person, a stylistic choice I’ve never been very keen on – I’d rather see all first person or all third person. But that’s a personal preference and one that doesn’t really detract from the gripping storyline and the satisfying emotional resolution. For fans of sweet romance with a dash of suspense, and those who dream of love under the Italian sun, Going Back is a recommended read. Going Back is published by Tirgearr and is available from retailers including Amazon US, Amazon UK, Smashwords, and Apple.